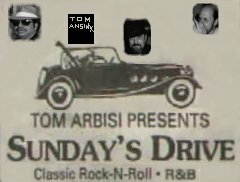 Sunday's Drive is a group formed by Tom Arbisi (Bass, Vocals, Acoustic Guitar) many many years ago in the Virginia area Click on the link to check out their history. I became a member of the group in 1995, after leaving the Wiseguys. Tom Arbisi left the Wiseguys, and together we reformed Sunday's Drive, and began playing within the Fredericksburg, Warrenton, and Cullpepper areas. Most notably "The Jailhouse Pub" in Culpepper. We became the Pub's favorite band, and played many a weekend out there. The group still performs today on an adhoc basis. Tom performs regulary at open mic at Yakadoo's and downtown Fredericksburg at Orbits. Music is in his blood, and while not performing professionally with the "Drive", he lets it all out with his open mic performances, and keeps everything going strong so that Sunday's Drive can perform at a moment's notice. Tom and I together are known as "The Bookends". Everyone thinks we are brothers (him being the oldest HA HA) . Tom Ansink ( Percussion) has been playing in bands with Tom since high school. Currently he performs with other musicians doing Jazz. When playing onstage with Tom Ansink, one never has to worry about losing a beat, he is totally incredible on the drums. Kenny Rosen, originally from the Bronx, is on Elelctric Piano, and Mouth Harp, and that boy sure can play. It is always a pleasure perforrming with Kenny. His solos on both instruments are honed to perfection. When he sings Stormy Monday.... you feel like you got the blues all over again. Joe Hasselvander- Records with the English Group "Raven". This guy cranks on the drums, I have enjoyed grooving with him on all occasions. He also plays the guitar. James Sibley- Another excellent drummer formerly with the Fredericksburg area group "Silver Wings". James is a great person to both know and play alongside of. Kim Beamer- Drummer/founder of the group "The Wiseguys". Though busy with the Wiseguys, Kim is always available to fill in with the Drive when he is not working. Phil Hasselvander- Yes, that's Joe's brother. Fantastic guitarist/Vocalist who has joined the group on many occassions as another lead guitarist. When Phil is with us, him and I crank out the licks like it was the last night on Earth for guitar playing. Phil and I grew up in the same era, following much of the same musicians. I thoroughly enjoy his playing.